1. FirstWords. Children learn to spell words by dragging scrambled letter to its correct order. It’s Kaye’s favorite game. Although I have noticed she matches the letters from the end of the word to the beginning. There is a sample version that is free with limited amount of words. Other versions include animals ($1.99), vehicles ($1.99) and deluxe ($4.99). 2. PopMath Basic Math. 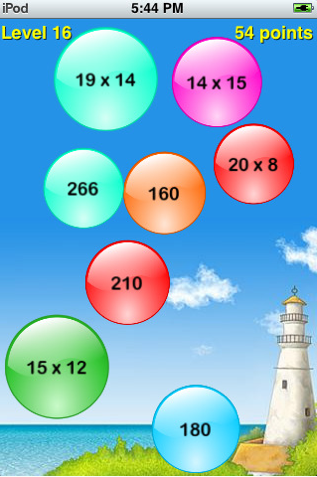 For $0.99 this app can teach your children basic math in a fun popping bubble game. They challenge themselves as each level is timed to see how long it takes to pop bubble question with the correct answer. 3. iWriteWords. Another of Kaye’s favorites. 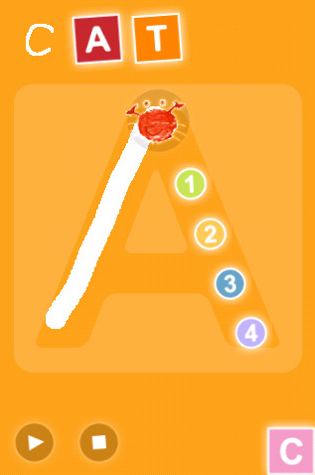 It teaches her to write words and numbers by tracing and following a little crab. The lite version is free but has a few words for them to write. While the regular version is $1.99. As a mom, I like this one the best. 4. Smack It. This is just a fun one to let the time pass. I have the free version and the deluxe version is $0.99. Kaye has fun smacking the moles back in the ground. It makes her giggle every time. 5. MyPaint. Bring out their creativity by giving them a blank canvas to draw. Or you can upload a picture from your photo albums and make faces. There is a free version or regular is $1.99 with additional features. » Tell me… Do your children have favorite apps they use? Which ones? My little ones like Thomas the Tank and Dot-to-Dot. My middle daughter likes hang-man and my big kids like Chess (we have a free version) and Sudoku. I love the NYT crossword puzzle. Right now my kids are loving Elmo’s Monster Maker and Grover’s Special Number. Isobel is nearly 4 and Oliver nearly 2 and they BOTH love them. I have “Toddler Tamer” which is basically just screens where the kid touches the screen and different objects come up like balls, tractors, binkies, etc. and it makes a cute little noise. Easy for really little ones. I also have “Peekaboo Barn” which is Evan’s FAVORITE! A little barn comes up and it shakes and an animal makes noises like a cow moos and the child touches the barn and the barn opens and a little kid’s voice says “cow” and then you touch and it goes to a different animal. It’s so cute! Hi Tiffany or anyone else, are these apps available on the iTouch? I don’t want to get an iPhone because of the cell phone plan, but I’m thinking of getting an itouch. yes. you can get apps for the iTouch too. Those are great finds… I have ABC Animals and Gia loves it. She also loves to play Cooking Mama (I love that one too). 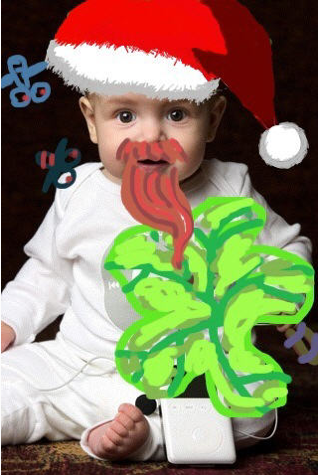 4) iToddler – Some free app that just pops up images and noises when you touch the screen. Keeps him very entertained for some reason. 5) TouchPets – Another free app with this virtual dog game. He likes to feed the dog food and water, and also “roll” the ball around for the virtual dog to play. 6) Paper Toss – Amazingly he plays this game better than I do! 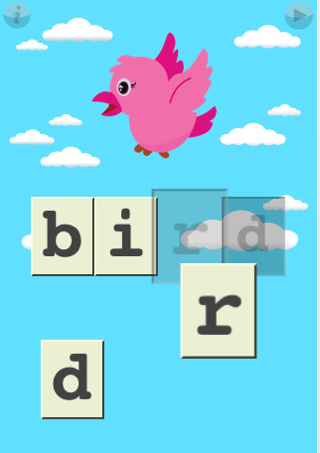 Just some silly free app where you flip rolled up pieces of paper into a trash can. My two year old loves Peekaboo Barn & Peekaboo Wild, Kideos, Talking Carl, & Crayon Doodle. Thanks for the ideas! My 4 kids range in ages from 10 to 2. My 2yr likes Graffe’s Preschool Playground. 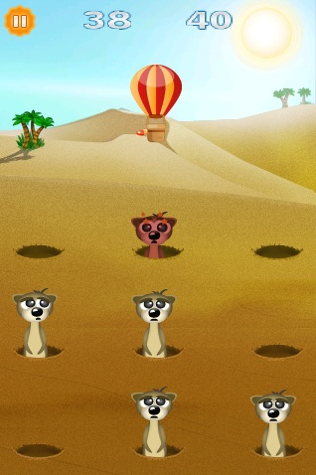 It has several games, a memory type, find the animal, numbers and letters, and music. It was a life saver to keep my little guy busy while we spent 4 days in the hospital with Pneumonia, My 4yr loves Teach Me Toddler – it learning without them knowing. She loves that she can earn “stickers”. A few other favs are Animal match, Four Free (like the game Connect 4) and a coloring app and Fisher Price Chatter Telephone. Al lvery fun and keep kids busy and quiet – got to LOVE that! !